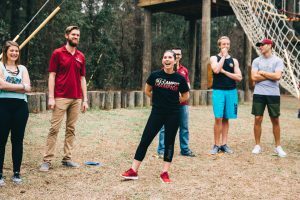 The FSU Challenge is Florida State University’s teambuilding program, located at the FSU Reservation. 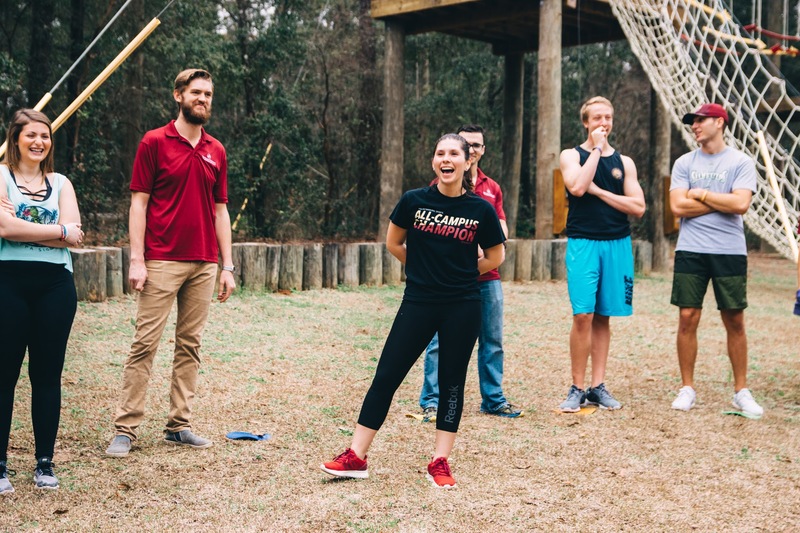 The FSU Challenge provides opportunities for groups to participate in a variety of unique and exciting activities that encourage communication, trust, leadership, civility, and above all, fun! 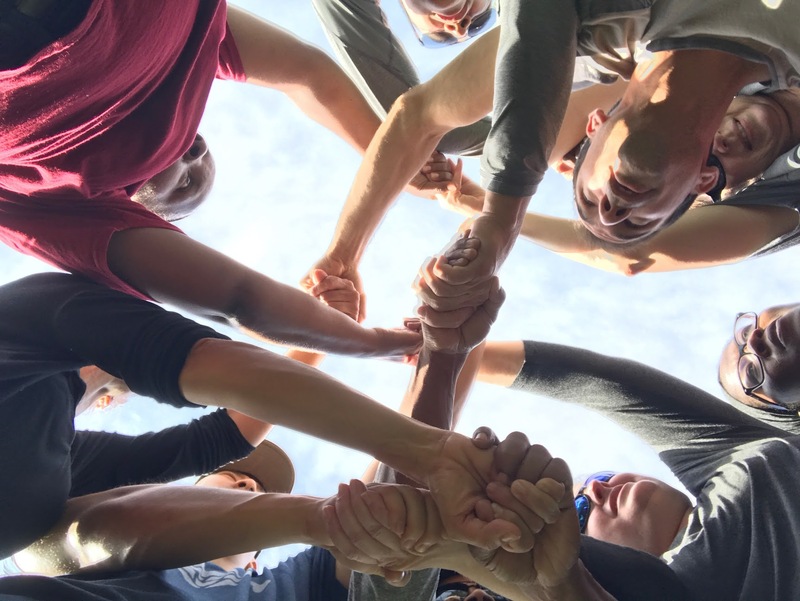 You might be thinking to yourself, “What’s the difference between Team Building and Team Bonding?” Our Team Building programs offer groups the opportunity to work through challenges with specific learning outcomes in mind. Our facilitators will tailor the activities to your team, allowing them to take the lessons they’ve learned on the course back to the office, classroom, and real life. Our Team Bonding programs are designed for one reason, to have fun! 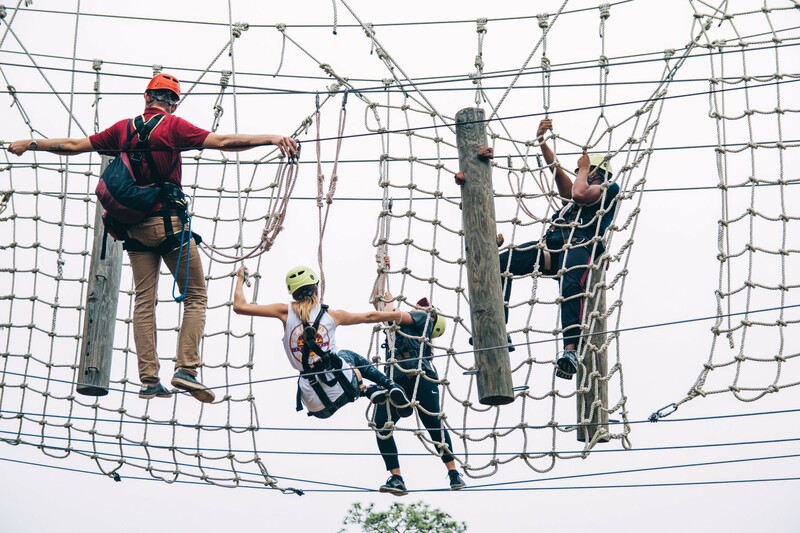 If you’re searching for a place for your team to enjoy each others company and experience an adrenaline rush together, this is the option for you. Whatever the occasion, all sized groups are welcome to come out and participate in our programs. Visit our Facebook page for pictures and information on upcoming events! Express Courses provide two hours of low-risk challenges in an open-field setting. 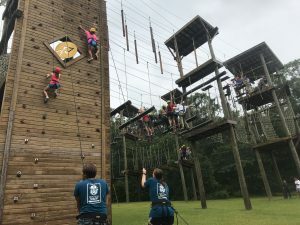 Great option for groups looking to pair a challenge course with another activity at the FSU Reservation, such as a picnic or paddling excursion. You and your team are master safecrackers. Today’s challenge: a bank heist at the heavily guarded Valley Isle National Bank under surveillance. When the 60 minute timer starts ticking, you are tasked with cracking the bank vault and escaping with the loot. The security system has been successfully shut off for 55 minutes. When 5 minutes remain, the cops will be notified, and the pressure is on. Our portable escape room is part scavenger hunt, part puzzle-solving, and ALL fun. Will you beat the clock and escape? The “team building” package includes a 60 minute escape room experience and a debrief by one of our Challenge course facilitators. 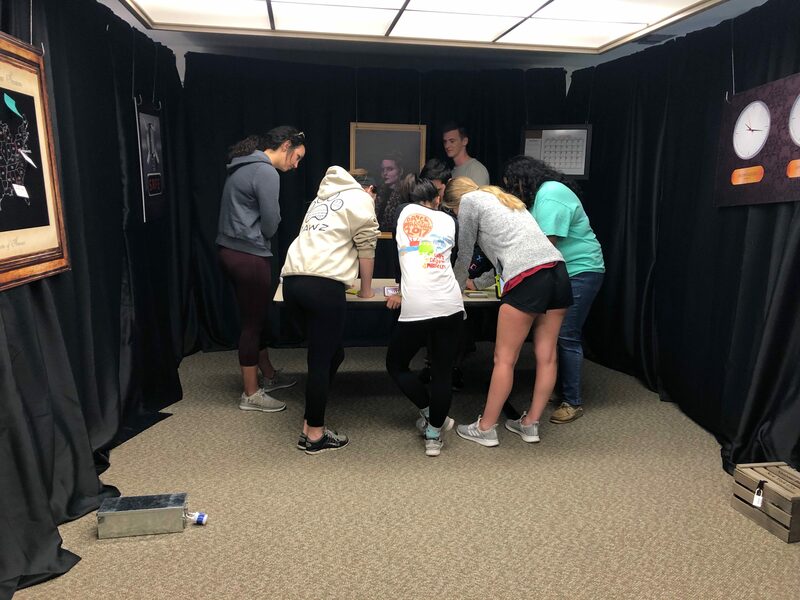 The debrief will allow your group to focus on the team building components of the escape room. Upon escaping successfully, your team will be able to reflect on how to use these learning outcomes throughout everyday tasks. Low Challenge Courses provide low-risk challenges in a combination of field and wooded settings. 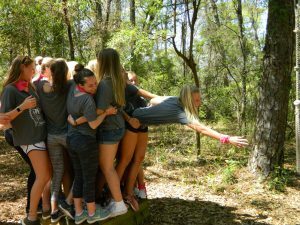 Low challenge activities are the foundation for building effective teamwork and may incorporate balancing, jumping, or climbing on special structures. Each activity can be adapted to accommodate most ability types, and participant safety is supervised by trained facilitators. During the program, time is taken to discuss the experience and relate the experiences back to “real world” situations. High Challenge Courses provide low-risk challenges with activities that may be conducted at a height of approximately 40 feet. Participants will be secured on a belay device with constant supervision from a trained facilitator. 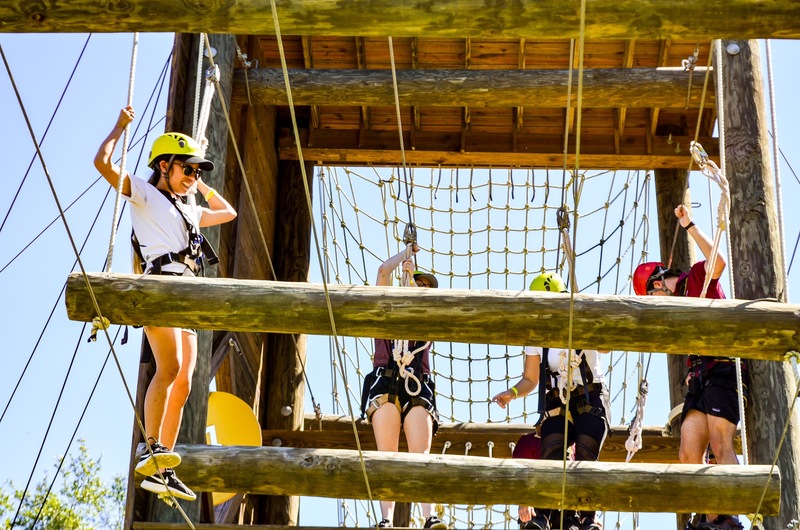 High challenge courses may incorporate balancing, jumping, or climbing on special structures. Each activity can be adapted to accommodate most ability types, and participant safety is supervised by trained facilitators. A high challenge course may be an ideal option for groups looking to give participants a combination of group and individual challenges. *For participation in High Challenge Course activities, participants must weigh between 50 pounds and 280 pounds, and be able to appropriately fit into our safety equipment. Please contact us with any questions your group members may have. Combination Courses begin with Low Challenge Course activities followed by a High Course adventure. This is a great option for any group looking for the best of both experiences! Off-Site Programs are available upon request. 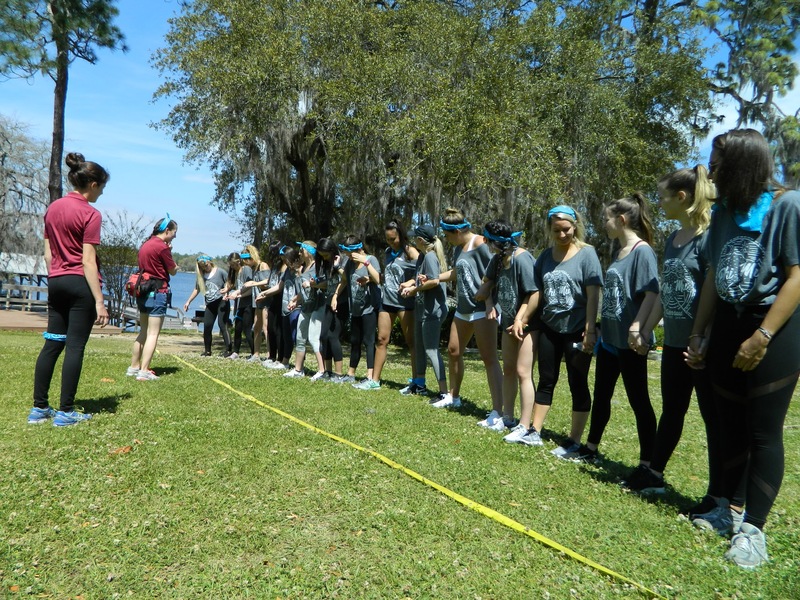 Our facilitators will come to your location in the Tallahassee area to lead teambuilding activities. Activities may be limited depending on group size and location. Simply submit a request to get the conversation started on how we can help meet your teambuilding needs! 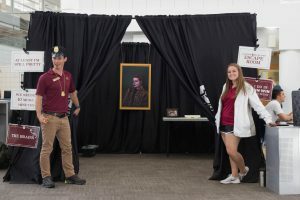 The “team bonding” package includes the 60 minute escape room experience presented by an instructor who will set the mood and provide a clue or two during the heist. Your team will put your brain power to the test and collaborate with each other in order to solve puzzles, crack codes, and ultimately, escape! Are you wanting to add some excitement to your upcoming event out at the Rez? Whether you are having birthday party or company retreat, come and get vertical at our 40 foot climbing wall. Our 3 hour wall rental includes all of the necessary climbing equipment along with two of our climbing instructors to teach you the basics, belay you up the wall, and keep you safe. Our wall allows for multiple climbers at once and is a great option for all ages. We have had participants as old as 93 and young as 3 years old come and give it a try. *For participation in Climbing Wall activities, participants must weigh under 280 pounds, and be able to appropriately fit into our safety equipment. Please contact us with any questions your group members may have. This ain’t your grandma’s zip line. 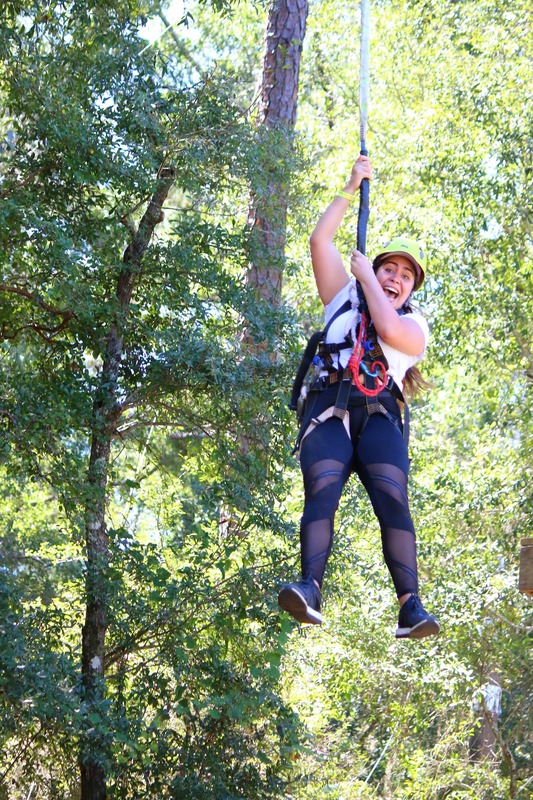 Our Zip Jump takes the excitement of zip line and pairs it with the adrenaline rush of a quick rappel. After you climb up our 40 ft tower you will have two choices, our Ripper or our TruBlu. Our Ripper involves one big step into thin air, followed by a 10 foot freefall. After the free fall your rope tightens up and the ride ends with big swing down the ground level. If you are not feeling the free fall option, our TruBlu begins to lower you as soon as you step off of the platform, resulting in a longer, more scenic ride down to the ground. 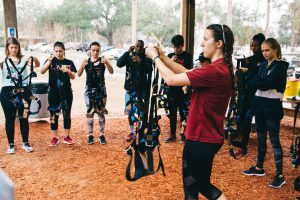 The Zip Jump Rental is 3 hours allows for members of your group to do each option as many times as they would like. 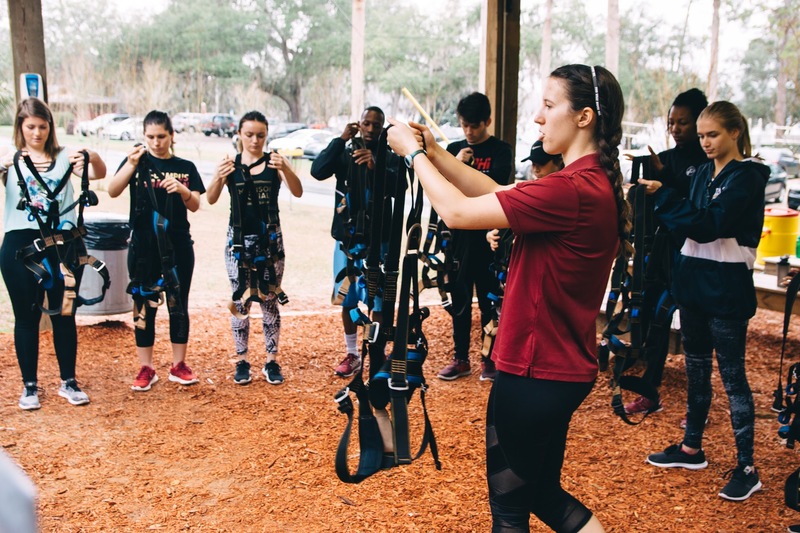 *For participation in Zip Jump activities, participants must weigh under 280 pounds, be at least 8 years old, and be able to appropriately fit into our safety equipment. Please contact us with any questions your group members may have. If the swings were your favorite activity at the playground, then you are going to love ours! 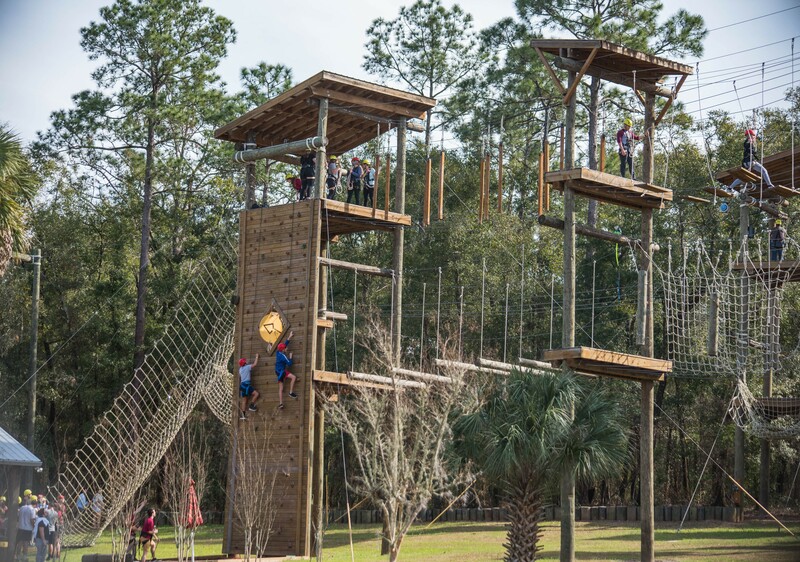 Your adventure begins by climbing up our 40 ft tower. Upon reaching the top, our facilitators will clip you into The Giant Swing which puts your average playground swing to shame. Our nickname for it is “The Breath Taker,” and for good reason. Next comes one little hop off the platform and a giant 95 ft pendulum swing into the canopy. It is sure to take your breath away! The Giant Swing Rental is 3 hours in length and allows for members of your group to participate as many times as they would like. *For participation in The Giant Swing activity, participants must weigh under 280 pounds, be at least 8 years old, and be able to appropriately fit into our safety equipment. Please contact us with any questions your group members may have.